Coverage: Live on BBC One, HD, Red Button, Radio 5 live, BBC Radio Berkshire, online, mobile, the BBC Sport app and Connected TV. Reading fans have had to wait nearly nine decades to see their side in an FA Cup semi-final. A total of 88 years have passed since the heroes of 1927 lost 3-0 to Cardiff City at Molineux in an FA Cup run which included victories against Portsmouth and Manchester United. That wait will end on Saturday when the Royals take on the holders of the cup - Arsenal - at Wembley. From Wembley heartbreak to cigarette cards, BBC Sport previews Reading's big day. Alf Messer was one of the stars of Reading's 1927 team. The centre half would later play for Nottingham Forest and Tottenham and his daughter Fay West will be at Wembley on Saturday as Reading look to go one better than the class of 27. "I hope and pray they do, I would love to see them play in the real Wembley final," West told BBC South Today. "Dad was one of those people who could charm the birds out of the trees. A very likeable guy. He was a pillar of the local community. "A lot of people who saw him play told me what a great player he was and the perfect gentleman. They said he was the best, the greatest on and off the pitch, always shook hands with everybody and was a great crowd puller, Elm Park was always full. "It makes me very proud. My dad played in 1927, it brings back a lot of memories with the photos I've got of him and let's hope the team can go one better." Club historian David Downs has seen many Reading teams over the years but says the side of 1927 are still held in the highest esteem. "Revered is the word because until this season 1927 is the only time we have ever been in an FA Cup semi-final," Downs said. "Reading had just been promoted from the old Division Three south, so for a Division Two side to get to the semi-final was a remarkable achievement. We beat some very good teams including Manchester United. "They were mid-table in Division Two, playing very well and had beaten some very strong sides on the way. Hopes were high we would beat Cardiff in the semi final and for the first time in the club's history reach an FA Cup final. It wasn't to be. "Alf Messer, a tall, six foot plus centre half was an outstanding player. The leader of the team and was playing so well. He later transferred to Tottenham Hotspur and is remembered with great respect and affection. He featured on a cigarette card which was a great distinction in those days." 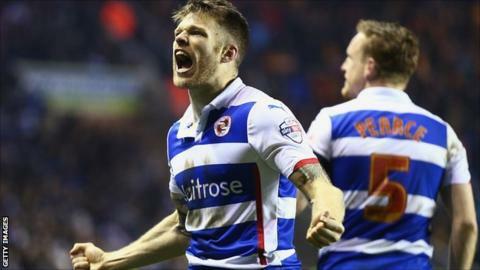 Defender Alex Pearce came through the ranks at Reading but was on the bench the last team the club played at Wembley - the 4-2 play-off final defeat to Swansea City in 2011. "The day was a contrast of emotion," Pearce said. "It was really, really difficult and I hated every minute of it. I'm not a good watcher of the game. The safest place to be is out on the pitch. "It would mean the world to me. I've been at this club since I was 12 so to come through the ranks and represent this club in a Wembley semi-final will be fantastic. "Wembley days are few and far between in a player's career. Some players don't get the chance to play at Wembley at all. To be able to do it twice is great and hopefully I'll play on Saturday and do well. "Arsenal are one of the top sides in Europe but anything can happen in the cup and we are going to Wembley in high spirits and looking to cause an upset." Reading have endured a torrid season in the Championship, sacking manager Nigel Adkins in December before bringing in Steve Clarke. The FA Cup has been the highlight of a forgettable league campaign. "You never turn your nose up at a good cup run," Clarke said. "The league form has been disappointing and the cup run a bonus so we want to go one step further. "It's been a long and difficult league campaign and the cup has been a little oasis in the desert. It's something we've enjoyed, the games have been good to us and hopefully they will be good to us on Saturday. "In football anything is possible, it's 11 versus 11. If we can play to our maximum, play without mistakes then we have a chance to go through. "It will be an upset, no doubt about that. Everyone in the country expects Arsenal to be in the final so hopefully we can spoil that." Cis Platten, who will be at Wembley on Saturday, was a young girl the last time her club reached an FA Cup semi-final 88 years ago. The 93-year-old was just six when the Royals took on Cardiff in that semi-final. Along with her late husband, Cis was a programme seller at Elm Park for 50 years and is the oldest member of STAR Supporters' Trust at Reading. She follows the club home and away and has only missed games because of a broken hip and a Daniel O'Donnell concert. "It's entertaining and somewhere to go," she added. "My boys always say they have to make an appointment to see me because I'm always somewhere. I really love it." Sir John Madejski became chairman of Reading FC in 1990 when he rescued them from financial difficulty and has since transformed the club. In 2006 he helped guide them to the top tier of English football for the first time. "Tomorrow is carnival time, it's when the whole of Reading gets in buses, cars and trains to go to Wembley for an epic game," Madejski told BBC Radio Berkshire. "If the fans lose their inhibitions, make a lot of noise, get right behind the team that can make the difference. "They are so crucial and can lift the players when they need lifting and make things happen. We've got to go there and enjoy it and give positive energy. "There will be people there tomorrow who will remember it for the rest of their lives. It's a positive occasion for the people of Reading to let their hair down"
In August 2014 Reading announced a "partnership" with a Thai consortium led by 76-year-old businesswoman Khunying Sasima Srivikorn. Sasima has flown back for the game. "Everyone is keeping their fingers crossed," Sasima told BBC Radio Berkshire. "When I was young and studied here I went to the old Wembley, I can't explain, it's just overwhelming. "It's the most exciting thing that has happened to me as the co-owner, it's something that is absolutely amazing. "When I bought my new house, I asked the designer to decorate my dining room in royal blue. I'm wearing a royal blue scarf which I knitted myself. "The minute I heard we were in the FA Cup semi-final I started knitting which at my age is unusual. Everyone in Thailand asked me what I was doing and I told them: 'I'm knitting for the FA Cup'." Friday's South Today will be live from the Match of the Day studio at Wembley ahead of Reading's semi-final against Arsenal. Tony Husband will be joined by Royals legend and BBC Radio Berkshire presenter Ady Williams to look ahead to the big game between 18.30-19.00 BST with features and news ahead of the club's first FA Cup semi-final since 1927. The programme will also take a look behind the scenes at the stadium.